News that Apple founder Steve Jobs has lost a large amount of weight in a short period of time has prompted, rather than quelled, speculation within the Apple community. Thousands of customers have posted on Internet forums and Twitter that there may be more big announcements to come. "I hope it is the iDiet. There were a lot of rumours about it at the last MacWorld," said Geraldine Billingsworthski from San Fransisco. "I have been waiting for this for years. I need to get down to about 300lbs and an Apple iDiet would be the best on the market." Speculation is rife at the last Macworld, this year, that Job’s gaunt and thin appearance at last year’s Macworld, was due to a new breakthrough. "It is clear that Apple have been working on something big, and this talk of the iDiet is something that many Apple geeks are getting steamed up about," sweated technology commentator Mr Bloggy as he ordered a pizza on his iPhone. "And we know the success Apple has had with making things smaller, just look at the iQueue." There has been talk that the iDiet will include all of the features of the market leader, Weight Watchers, with the portability of the Slimfast series of protein shakes. But costing at least £250 more. However commentators are pointing to the recent announcement that in fact Steve Jobs is suffering from a hormone imbalance and that many people desperate for the iDiet may be better off buying a real apple for lunch. "If it is a hormone imbalance, then perhaps the iDiet contains iGender transformation functionality," gibbered Miss Billingsworthski. "I would be up for that, although standing to pee seems like hard work." 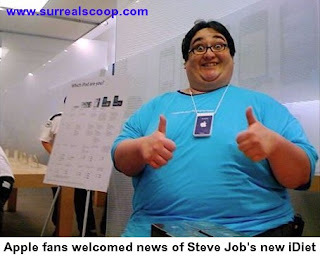 "The latest buzz is that we won’t see Steve at Macworld because the iDiet includes iNvisible technology," said Mr Bloggy. "Although I think talk of the iGender is madness, I clearly want to see the iNvisible when it appears." steam wallet codes gift codes and generator with play as very helpful for me this website that can generate for you the homepage the steam wallet codes.